Following on from the announcement of the finalists for this year’s 5th annual Prestige Agri-Awards, there was excitement in the air when the winners of 2018 Western Cape Prestige Agri Worker were announced. 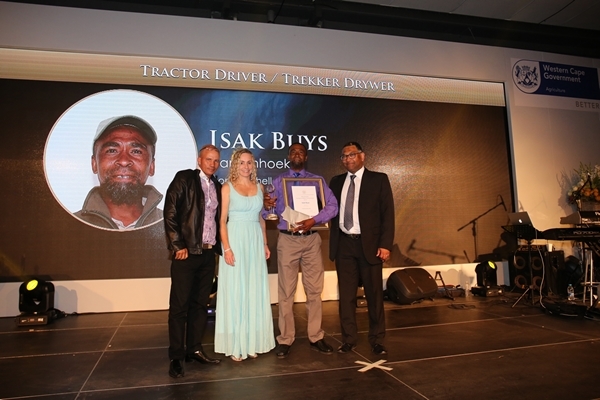 The results were announced at a gala event on 3 November at Nederburg Wine Estate in Paarl, which saw Isak Buys from Mont Rochelle walking away with the title of Tractor Driver of the Year. Isak is a long-standing member of the Mont Rochelle team, having worked at the farm for 25 years. According to his seniors he is a highly skilled tractor driver, and is continuously coming up with new ideas to ensure his vehicle and equipment are utilised as efficiently and effectively as possible. He enjoys training and teaching his less-experienced colleagues and is brilliant at what he does. Although he has many years of experience in this field, he is always willing to learn new tricks of the trade and is open to any training that is offered to him. Isak is definitely our ‘Jack of all trades’ having the expertise within a broad range of farming techniques such as spraying, garden irrigation, building, welding and basic mechanics. He’s also completed Vinpro training vineyard establishment and pruning techniques. He’s recently qualified as a Level 1 first-aider and is the only member of the team who’s been trained in veld fire-fighting. The Agri-Awards – an initiative previously known as the Farmworker of the Year competition – honours excellence in the province’s agricultural sector. In doing so the competition is able to acknowledge farmworkers for their hard work, who make a significant contribution to our country’s economy. The competition is co-sponsored by the Western Cape Department of Agriculture and the Shoprite Group, with the latter being involved with the initiative for the past seven years.